US presidential hopeful Elizabeth Warren says she'd consider dismantling the tech giants should she ever get the top job. But is this really necessary or even possible? 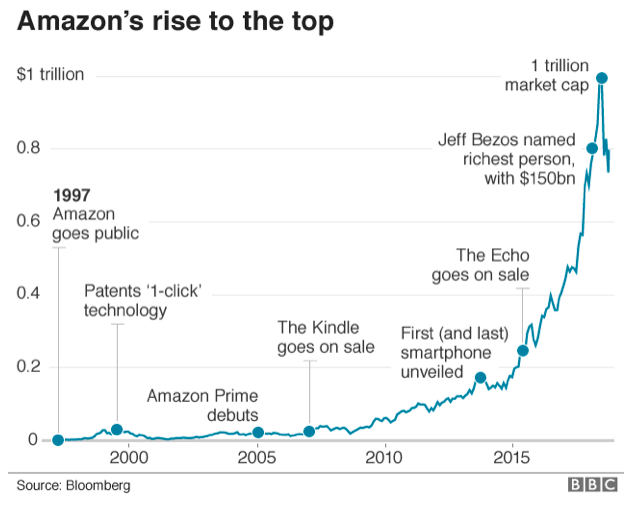 A growing chorus of people think the big beasts of the tech world - Apple, Google, Facebook and Amazon - are getting too big for their boots and should be dismantled. But as Prof. Harry First, an expert in competition law at New York University, says: "Breaking up is hard to do", recalling the old Neil Sedaka song. Critics say these US-based behemoths dominate the marketplace, use their hugely popular platforms to prioritise their own products and services, and seem perennially able to evade the discipline of most regulators. Concerns are growing that social media platforms such as Facebook and Google-owned YouTube are becoming havens for malicious users spreading illegal, false or terrorist-related content. And the European Union (EU) in particular has criticised big tech firms for not paying enough tax. 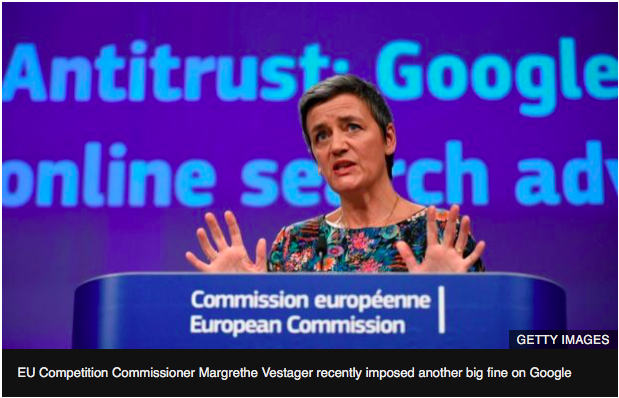 In March, the EU hit Google with a €1.49bn (£1.28bn) fine for blocking rival online search advertisers. It's the third large fine the EU has handed Google in two years. The total bill now stands at more than €9bn. But, as many point out, even if Google ever pays the bill, it's a relatively small slice of the company's cash reserves, which currently exceed $100bn (£76bn). Those who advocate breaking up big companies argue that smaller firms competing with one another on a relatively level playing field will give consumers more choice. Increased competition, the argument goes, also makes firms less inclined to behave badly. Take supermarkets as an example. Price competition is fierce, consumers can shop around for good deals, and new players can enter the market - think of Lidl and Aldi when they arrived in the UK. Competition authorities don't like it when big companies merge to the detriment of consumer choice, which is why Sainsbury's and Asda are finding it so hard to get their proposed tie-up past the UK's Competition and Markets Authority. Big tech, however, is a different kettle of fish. "As it stands, it is difficult for users to switch between platforms," notes the MIT Digital Currency Initiative and the Center for Civic Media, "and most mega-platforms do not interoperate". In other words, once you've bought into them, you're stuck. And then there's all the data they've collected - gargantuan stores of information about our likes, dislikes, shopping habits, music and entertainment preferences, search habits and so on. It's a hugely valuable resource to which few have access. Some think mega companies become "too big to innovate" and simply snaffle up ground-breaking start-ups. "This is why Facebook couldn't invent Instagram - they needed to resort to buying them up," says Prof Howard Yu at IMD Business School in Switzerland. Alphabet - Google's parent company - has bought more than 200 firms, for instance. And Simon Bryant at market research firm Futuresource says he often has conversations with smaller companies who regularly see their ideas repackaged by the giants, who of course already have access to a large consumer base. "On the one hand they want to work with them, on the other hand they find it very difficult to compete," he says. Amazon is often cited as the bogeyman of the traditional High Street, responsible for book, fashion and music shop closures. But Sam Dumitriu from The Entrepreneurs Network, a think tank, argues that tech disruptors can shake up established markets to the benefit of consumers. For example, when Amazon bought Whole Foods, the bricks-and-mortar grocery business, retailing giant Walmart was forced to rethink its home delivery strategy as a result - teaming up with Uber, Lyft and Postmates, for example. "Suddenly users in the US had better access to home delivery of foods," says Mr Dumitriu: "It benefits consumers." But even if you do think breaking up big tech is the way forward, Prof First says your options are sorely limited. US competition law makes it very hard for courts to find a legal basis on which to justify splitting up a large company, he explains. If there is evidence of bad behaviour then a judge could conceivably make such a demand. But companies can promise to "fix" the bad behaviour and move on. That's more or less what happened 20 years ago, when a US judge ordered that Microsoft be split in two. It never happened. Partly because Microsoft agreed to make changes so that competitors could more easily integrate their software with Windows. "Trying to fix them may be better than not trying, but you can't go into this thinking we have some sort of magic wand," says Prof First. He argues that making the tech giants' data available to competitors might be one way to curb their increasing power. Google's huge map databases could be licensed to other companies seeking to make their own map-based apps, for example. These start-ups might fail, or come up with something significantly better and more innovative, he says. This is a similar approach to that recommended in a recent UK government report on competitiveness in the digital economy. Rather than advocating the break-up of big companies, its author Jason Furman suggests that they be forced to allow consumers to port their personal data to competing firms. Don't like how Facebook is running things? Simply request that your data be ported to your new social network of choice. And Prof Yu has another idea. In a region like Europe, which is well placed to apply some investigative pressure to foreign companies, why not subject big tech firms to audits of their algorithms, a bit like how banks' accounts are audited regularly? Prof Yu says that there are plenty of capable data scientists in the EU who, were they allowed access, could make sure that big tech wasn't unfairly prioritising its own services within its platforms, or locking away and misusing people's personal data. "It's not really breaking them up, you just scrutinise them," he says. So, like a doctor dealing with a nervous patient, the regulator could firmly insist: "Don't worry, it's for your own good."